Kenya's Free Schools Bring A Torrent Of Students Kenya, like other countries in East Africa, has dropped many of the fees that kept poor children out of public schools. More kids are now attending, but there's a desperate shortage of books, teachers and other basic needs. Kenya has made its public schools free, which has dramatically increased the number of students. But this has also led to overcrowding. 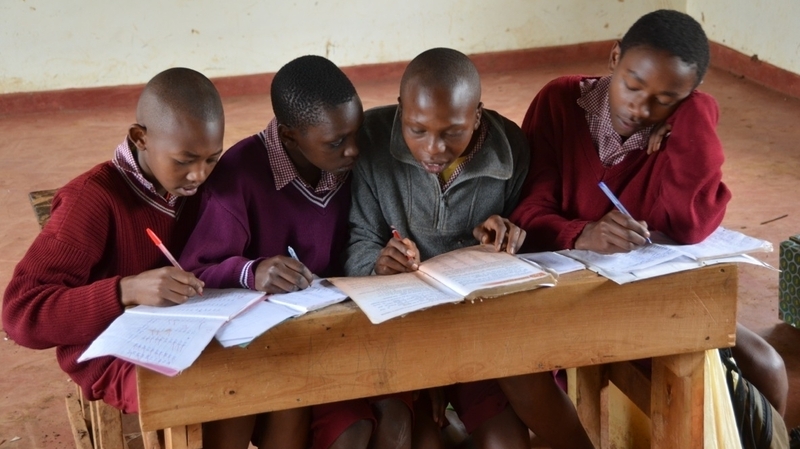 Here, four boys share a desk and a single textbook at the Amboni Secondary School in central Kenya. Parents of U.S. students often complain about things like too many standardized tests or unhealthful school lunches. Kenya wishes it had such problems. Kenya dropped or greatly reduced fees at public schools nearly a decade ago in an effort to make education available to all children. On one level, it's been a success — school attendance has soared. Yet this has also exacerbated chronic problems that include shortages of qualified teachers, books, desks and just about every other basic need. Kenya is struggling to have universal primary education by 2015, but its experience highlights the frustrations of a poor country trying to meet such goals. When visitors arrive at a Kenyan primary school it's something of an event. At Amboni Primary School, north of Nairobi and just outside the boundaries of the spectacular Aberdare National Park and game reserve, children stream out of their classrooms and break into a song: "Everybody today is happy to see you ..."
A decade or more ago, many of these kids might not have been in school. They would have been hauling water, tending sheep or working in farm fields. Still, Kenya's nine-year-old experiment with free education is not working out as people had hoped. Kenya's attempt at universal education faces multiple challenges. In many rural areas, families want their kids to work during the day. At this school in central Kenya, Samburu kids who herd the family livestock are now taking classes in the evening. In 2003, Kenyan President Mwai Kibaki eliminated expensive school fees for primary schools and lowered them for secondary schools. The move honored a political promise and followed a trend of free public schools in the neighboring states of Tanzania, Ethiopia, Uganda and Malawi. "I come from a very poor family such that I was always going home [to collect] school fees," says Agnes Munuhe, a 50-year-old teachers' adviser, the 11th of 13 children of a subsistence farmer and his three wives in central Kenya. Because her parents could not always afford the fees, Munuhe didn't learn to read and write until she was 16 and did not finish high school until she was 25. When Kenya dropped school fees the result was dramatic. Public school enrollment went from 6.1 million to 7.4 million in just two years, from 2002 to 2004, and has continued climbing. The increase has included many girls whose families had held them back in this conservative society. But Kenya's tottering school system could not handle the flood of new students, and the situation has not improved as the initial crush of primary school students works its way through the high schools. "Kenya needs 80,000 additional teachers. It's that serious," says Munuhe, standing outside a classroom at the Kabiru-ini Girls Boarding School in central Kenya. Girls in green sweaters and bobby socks hurry across the ramshackle campus past bougainvillea bushes and drooping bottle-brush trees. Inside the tin-roof classrooms, it's common for five girls to share one textbook. "The government had hoped for a ratio of two students to one book, but this is not doable," Munuhe says ruefully. "The books are not there." And steep school fees are coming back. Two weeks ago, the Kabiru-ini principal had to send home 100 girls — nearly a third of the school — to ask their parents for money for things like teacher salaries, examinations, uniforms and new buildings. A study published by Britain's Sussex University in 2007 found that Kenya's free schools were "a matter of political expediency ... not adequately planned and resourced," and as a result, there have actually been more dropouts and a falling quality of education. Conversely, the number of private schools has increased tenfold as parents look for alternatives to overcrowded classrooms. The situation is similar in neighboring Tanzania, which did away with school fees a year earlier in 2002. The student population also skyrocketed, leading to packed classrooms, book shortages, overused toilets, a teacher scarcity and an increase in paddling students to keep order. With the Kenya Education Ministry stretched thin, schools are looking everywhere for foreign donors. In that regard, Mahiga Hope High School in central Kenya scored big. The Nobelity Foundation, a nonprofit based in Austin, Texas, stepped in to build a handsome two-story, stone classroom; a covered basketball court; a water system; computer and science labs; and a library of donated books, from To Kill A Mockingbird to Harry Potter. "Go to other schools; they literally have nothing," says principal Jane Wainaina. "The classrooms are wooden; the floors are mud. Mahiga Hope High School has been extremely lucky to have the Nobelity Project with us." But even with help from abroad, the Mahiga school struggles. The government, in theory, contributes $120 per student per year, but the subsidies arrive irregularly and are still not enough. Wainaina, too, sends three-quarters of her students home to collect money from their parents, most of whom are poor farmers. Some of the students drop out and never return. "It is not free as such," she says, "They use the word free, but it's not free." Even with all the problems, school administrators say more Kenyan children go to school than they did in the past. At an impromptu lecture by a visiting journalist at Mahiga High's Journalism Club, two dozen bright-eyed students listen intently to a talk about the importance of independent reporting. "I want to be a journalist," one student says shyly. "I want to help Kenya."